B: The Beginning’s focus on character development through bonds, madness, and beliefs creates a mystifying experience about the dark recesses of an individual’s psyche. The final episode addresses the mystery behind Gilbert’s motive for murder. The connection between Gilbert and Keith creates a better understanding of Gilbert when he pulls the trigger and breaks their bonds. In conjunction with Koku’s death defying battle to rescue Yuna, B: The Beginning’s storytelling is strengthened by the range of emotions and connections between characters. The characters convey believable truths behind the madness within one’s mind that manifests through murder, distorted convictions, defiance, and a yearning to belong. The depth and variety of instrumentals blaring in intense scenes, such as Keith and Gilbert’s final showdown and Koku’s deadly battle with Laica, are just a few of the instances where a viewer’s emotion races with the tempo. The show’s composer capitalizes on the techno keyboard and string instruments to ensnare the audience. This impressive performance continues as the story delves deeper into the mystery behind Market Maker’s attack and humanity’s ambition to become God by replicating beings known as Promising Ones. Instrumental sounds draw in the audience, add to the immersion of the world, and make tragic scenes all the more emotional. Relationships and depth define B: The Beginning’s ability to entrance viewers through its cast of characters struggling to defy their own destinies and vengeance. Koku and Keith exemplify the theme of Revenge because they want to overthrow Gilbert in order to move forward with their lives. Keith’s ability to solve cases using erratic thought adds to his character’s charm and our understanding of B: The Beginning’s world. Meanwhile, Koku’s struggle to stand against his fate invokes a yearning to have and fight for a companion. Throughout the show the two protagonists pursued their own paths. Their storylines eventually intertwine with the formation of bonds that can never be broken. 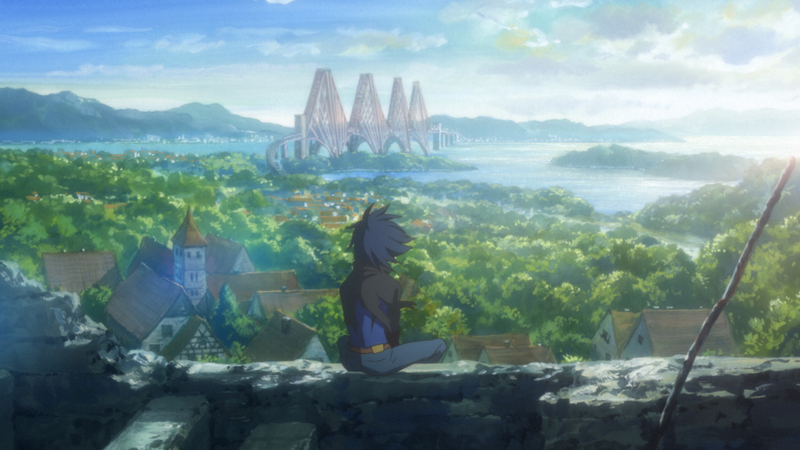 B: The Beginning’s theme of fate drives the development between Koku and Keith’s reactions to their circumstances and others’ perceptions of the subsequent events that unfold. In a way, the performance between the two protagonists and the show’s storytelling resembles a play. Madness driving characters to their breaking point shows viewers how far Keith, Koku, Lily, and Gilbert are willing to go to achieve their goals. From Lily’s pursuit of Gilbert to Keith’s death blow to Gilbert, and Koku’s supernatural battle with other children once part of the Promising One’s project, near death experiences happen to everyone. The emotional draw from every character striving to complete their goal and how their convictions become distorted the further they go adds to the show’s appeal. Koku and Keith are prime examples, but their morality in the end allows them to avoid falling into the darkness of one’s heart. The REGGIE characters, although creative, complicate the theme of inner demons, as they are beings easily corrupted by the darkness of sins and must medicate their desires in order to survive. This creates an additional layer of complexity in the plot. The show’s pacing and conclusion provide some closure for viewers, but the final scene asks more questions than it answers, teasing another season. A character briefly introduced in a flashback makes a sudden appearance. Viewers can easily forget this exchange, given the show’s compelling plot, Koku’s fight scenes and Keith’s eccentric behavior. While the added scene is a marketing ploy for another season, it might make viewers feel like there is more to the series. The storylines swiftly conveyed the generalities of major events that B: The Beginning’s world created and some viewers may feel either cheated or hungry for more. Despite the few lows that it had, B: The Beginning was immensely satisfying and I am incredibly hopeful for a new season.